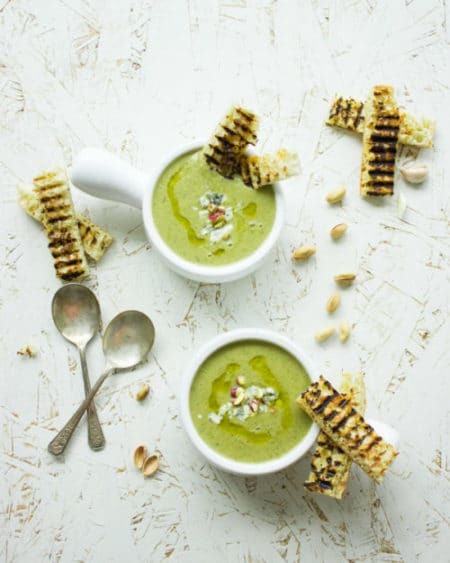 Try this light and silky smooth broccoli soup – completely made from scratch. The addition of blue cheese makes this simple soup elegant enough to serve at any dinner party! Use cashew cheese to make this a vegan broccoli soup. There’s always room for soup in my life. Always. This Smooth Blue Cheese Broccoli Soup is luscious, creamy and very comforting with a touch of blue cheese. 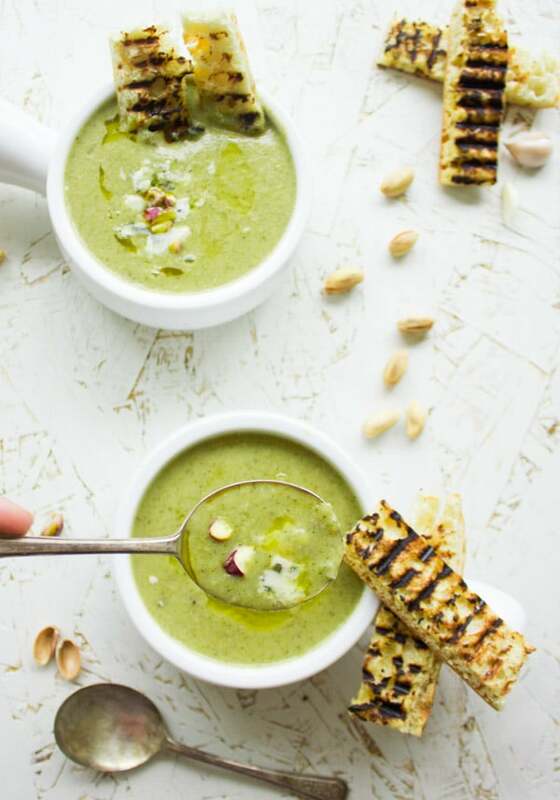 I top this creamy vegetable soup with some crunchy pistachios for a great contrast in texture and an extra boost of flavor! Just last week when I wrote this Juicy Spicy Turkish Meatballs, I bragged about the warm weather we were having..two days later our temperature dropped again and soup was back on our table. You know that feeling when you think you’ll be off soups for a while and suddenly a cold snowy day catches you unprepared. Then you don’t feel like any classic heavy soup or stew. You’d rather go with a brighter creamy and luscious vegetable soup. This Blue Cheese and Broccoli Soup is made for those days! Making soup is a breeze, be it a simple one-ingredient soup or one that asks for a handful of ingredients. 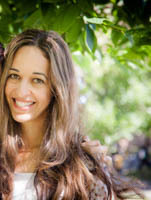 The process is super straightforward and requires next to no technique at all. Basically, the trick to making super delicious soup is to layer your flavors, add some secret soup thickeners and finish it all off with a sprinkle of garnishes that contrast the texture of your soup. This layering process starts off with sautéed onions, sweet bell pepper The sweetness of these sauteed veggies and the salty blue cheese go perfectly together. 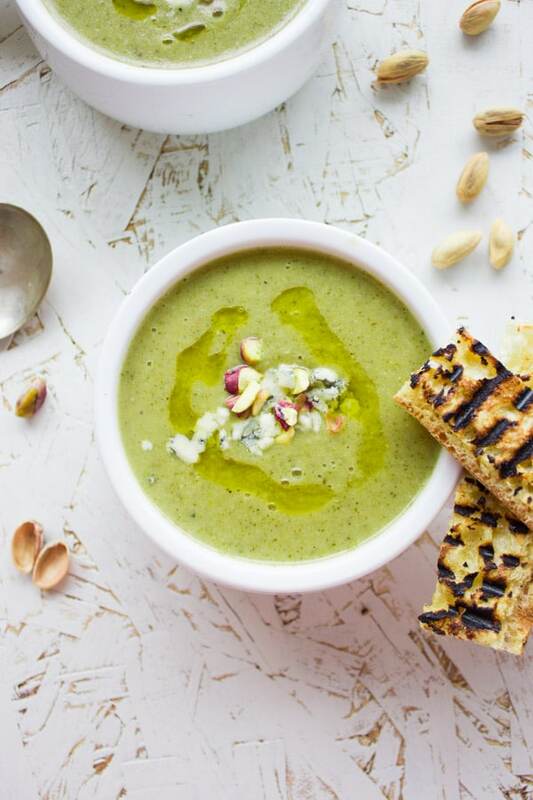 A hint of oregano adds a Mediterranean touch to this broccoli soup. If you’re a fan of chunky soups, you can make this broccoli soup recipe as chunky as you like—although I think you might appreciate the creamy texture much more here. My dad, aka the King of espresso, is also probably the King to be of blue cheese. He would add it to anything and just smothers it on toast in the morning. So as you could’ve guessed, he was the blue cheese influence to this broccoli soup. Can I make this Broccoli Soup vegan? Absolutely! A friend got me a brand of cashew based vegan cheese, it had a distinct taste quite similar to blue cheese. So I tried it with this broccoli soup and it was SOOO good too! 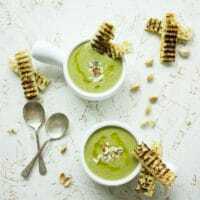 If you’re vegan, you can definitely make this broccoli soup and play around with different vegan cheeses—the stronger tasting the better. Sauté the onion, sweet peppers and garlic in olive oil over medium heat in a large pot. Add the oregano and sauté until the veggies are translucent and have a light golden color. Then goes in the broccoli and vegetable stock with more oregano. Once it cooks for just 10 minutes, then you’ll go right in with the thickener. Classically and commercially soups are thickened with flour or cornstarch. But I love to thicken my broccoli soup with a secret ingredient. My favorite secret thickener would be navy beans. Good old canned navy beans. Rinsed off and added in the soup, navy beans add a nice creamy velvety smooth texture (without actually adding any cream!). Plus they add protein, fibre, you name it. I add them to nearly all my soups because they’re super neutral tasting, so no one, NO ONE can ever detect the bean-y taste. Oats are a great healthy alternative, but also quinoa, barley, couscous and many other good-for-you grains/seeds work beautifully here. The broccoli soup at this point needs some blue cheese (or your vegan cheese), and just 10 more minutes of cooking time. I love pureeing it at the end with the final touch of oregano, and if the soup looks too thick I’ll add in some stock a tablespoon at a time. To be safe, I usually start off my soups on the thicker side and thin it as I go, to leave that thick texture if I feel like it. 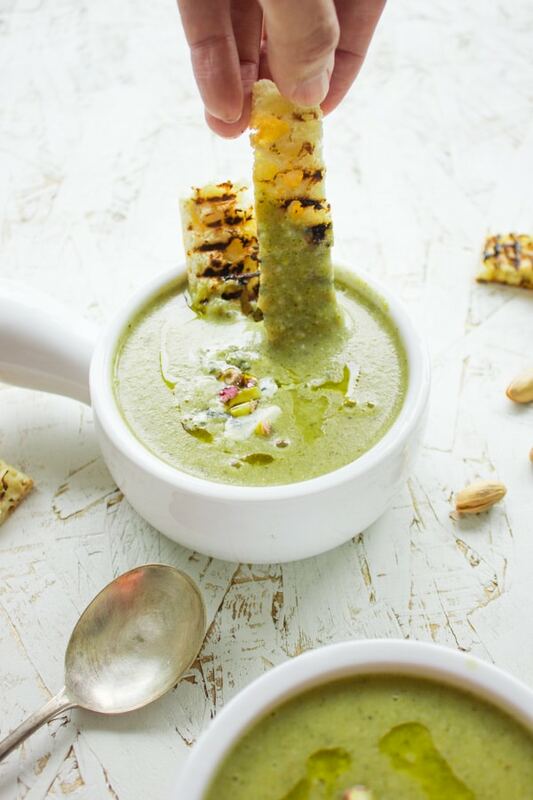 To garnish this creamy dreamy luscious broccoli soup, I love a contrast of nuts—so I chose pistachios. Any type of nut works great here. I LOVE nut garnishes on my creamy smooth soups—like this Cauliflower Hazelnut Pear Soup (which also has a secret navy bean boost). A touch of blue cheese crumbles for another contrast of melt in your mouth cheese taste with the broccoli soup just adds the perfect final touch! Instead of adding all the oregano at once—either at the end or at the beginning of the soup, try breaking down the full amount of oregano (or the spice you’ll be using in any soup) throughout the recipe. This layering of flavor makes a real difference. Feel free to add some more broth to the soup to make it thinner but remember to add any liquid very slowly and carefully. Once it is to thin, all you can do is try and thicken it with more beans. I love the pairing of broccoli and pistachios, but you can use any nuts you want! Walnuts, hazelnuts, and macadamias would be my recommendation. 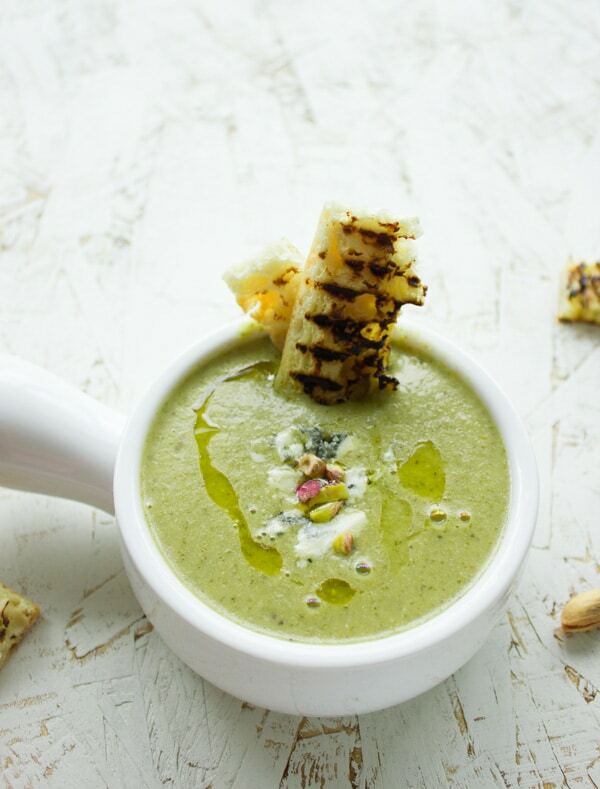 Try this light and silky smooth broccoli soup - completely made from scratch. The addition of blue cheese makes this simple soup elegant enough to serve at any dinner party! Use cashew cheese to make this a vegan broccoli soup. Then add in the broccoli florets and give it a 1 minute sauté before adding the stock. If you’re using low sodium stock you’ll need to add in some salt to your taste. And add the oregano. Let the mixture come to a boil over medium heat and lower the heat to low, cover the pot and let the broccoli florets cook for 10-15 minutes (depending n the size of the florets). Add the navy beans and blue cheese, and cover the pot again. Let the soup simmer for another 10 minutes until all the colour blend together. Uncover the pot, add a pinch of oregano and salt if needed, then use an immersion blender to puree the soup to a silky smooth texture. If you feel the soup is too thick for your liking, add a couple tablespoons of the stock at a time and puree. Repeat this step until you reach your preferred consistency. Or you can leave it as chunky as it is if you prefer a chunky soup.